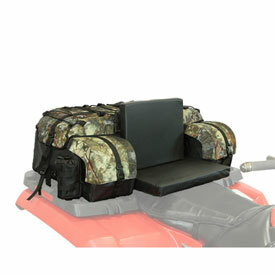 The ATV TEK Arch Series bags take ATV bags to a whole new level. The arched steel frame keeps the bags shape no matter how much gear you stuff into it. The arched frame and 1" weatherproof seal keeps a consistent gapless seal and the bags contents dry and dust-free! A Zipper less, fully removable lid allows you to access the bag from the front, back, left or right side and it can be taken completely off for unobstructed access. Other features of the ATV TEK Arch Series Bags include top bungee straps, (2) expandable drink holders, internal organizer pockets, front pockets and a removable padded seat. Dimensions: 11" H x 36" W x 19" D.
Very nice product. I highly recommend. Impressive Design and Function, Very Durable! I bought this bag for the rear of my ATV and when I saw it had a steel frame inside I didn't really know what to expect. I am pleasantly surprised how well it holds up to abuse of riding. The fabric hasn't ripped or faded in 2 years of heavy riding on trails. Dust and rain don't get in the bag at all (huge plus for me) and my stuff stays safe, dry, and clean. The seat is comfortable and it's nice to have that back support as a passenger on the longer rides. The two side bags are easy to access and come in handy for my smaller items like gloves, binos, and flashlights. Overall, this bag is well worth the money and will come in handy for anyone who owns an ATV. Highly recommended! This bag is a BEAST! This bag is unbelievable. I completely rolled my ATV in the mountains and I went to look at the bag and I assumed it had crushed the frame. Nope! This thing is apparently bullet proof. It looks great. It's big and roomy and extremely durable. I am very impressed with this bag. All of my riding buddies are going to buy one too after they saw the crash with the bag. Not a serious rider bag! This bag isn't designed for hard riding. The rails inside corners break and anything inside of bag that is hard will rub the side creating tears. This bag does have a lot of room but you cannot put a helmet into it. The drink holder Velcro also ripped in time. Straps holding bag to ATV ripped. If you do a lot of riding, maybe a season or two before it is all ducked taped up. I replaced my two with Ogio Honcho bags which I love. I have had my bag for about six months and I have taken my ATV out a lot this year. This bag has held up to everything I have taken it through. My wife is comfortable and says the steel frame gives her good back support. The bag is nice because it is weatherproof and without zippers it makes it easy to access my stuff. I think it is the best quality for the money. It has all the same aspects that the $230 bags have. I would recommend this to a friend for sure. I like the frame. it seems to be holding up well. I have gone through 3 of these bags purchased at a different retailer. First of all let me say that I absolutely love the design of this bag. The frame and arched cargo area with removable storage areas and padded seat area for passengers are a great idea. That's where the pleasantries end. The execution of these ideas is the big downfall of this product. The seams of this bag will tear out (mine have), the vinyl portion, which is what the removable smaller bags attachment points are sewn into can hold up to the abuse of atv riding. I have had 2 of these attachment areas tear out on me. The paint used on the framing of this bag will very easily chip off and the frame will begin to rust (even the paint of the smaller bags has chipped off and is rusting), perhaps the rusting occurred because I use my atv in the winter time since I have a set of tracks for it. I give this bag 2 stars instead of 1 because I think the design is excellent. However, the materials used are poor and the bag is cheaply executed. DO NOT PURCHASE THIS PRODUCT UNLESS YOU WANT TO BUY ONE EVERY 6 MONTHS.